Savvy Spending: Meijer: Free Promised Land Chocolate Milk Coupon! Meijer: Free Promised Land Chocolate Milk Coupon! 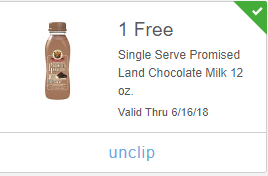 Log into your Meijer mPerks and see if you have a coupon for a FREE Promised Land Chocolate Milk coupon. FREE Promised Land Chocolate Milk, 12 oz mPerks digital coupon.